Sometimes, life is gonna hand you lemons. But we all know, when life hands you lemons, you’re make lemonade, right? But everyone seems to kindly leave off the part where to make lemonade, you also need sugar. Lemonade with no sugar isn’t quite the same thing. But more realistically, life will be much more generous than just handing you lemons sans-sugar. Sometimes, life will hand you lemons, nails, sticks and stones, and anything else sharp and sour it can get its hands on. 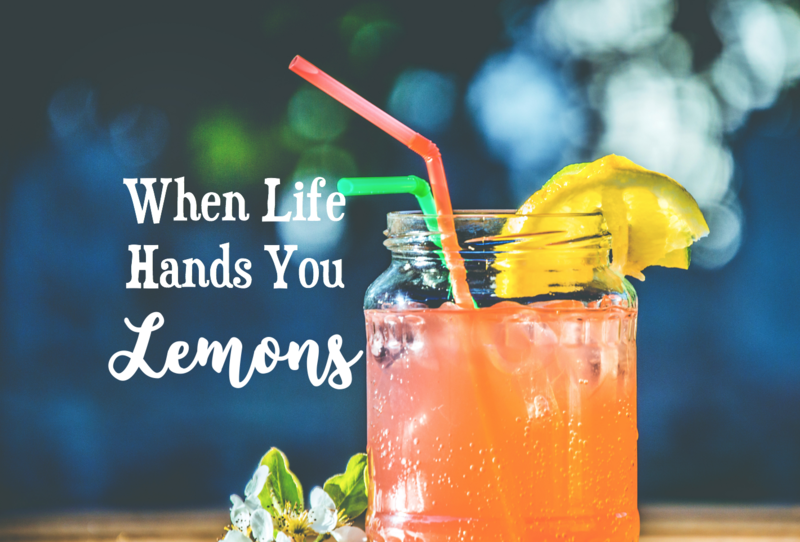 Sometimes, life won’t just hand the lemons to you, it’ll pelt them at you. Or, that’s what it’ll feel like at least. But until two weeks ago, I was at least finding sugar to make lemonade with the lemons I was being handed. But two weeks ago, life started pelting me with so many lemons and nails (in my tires, but I’m getting to that) that it was nearly impossible to find the sugar, silver lining, glass-half-full, or anything else to sugar coat it. I won’t get into the hairy details, but take my word for it, it was one of my roughest weeks yet. It was a week complete with a flat tire that became even flatter tired once it was “fixed”, costing me two visits from AAA roadside assistance and three separate trips to the tire store. Conveniently, among the mess of other lemon-y happenings, that week I also had Big Little week in my sorority, three mid-terms, Gamma Phi elections, and a big-fat paper due. Oh yes, all that, and not only one, but two, flat tires. I’m no under achiever, if you haven’t noticed. Sometimes, life is going to hand you lemons, with no sugar, and stick nails in your tires. And when it does, you gotta learn which friends you can rely on to borrow sugar from, and you either gotta be armed with a hammer (to use nails to hang things, which I’ve been doing in my house, post on that soon), or learn what to do when you get a flat tire. You’ve got to learn to adjust, adapt, and keep moving forward, flat tires, sour lemons and all. You won’t get to choose when your lemons are handed, thrown, or squeezed at you. You won’t be ready when you find yourself away from home with your first flat tire (or two). You won’t get your bad-and-worse-things all spread out over time, so you can tackle them one-by-one. Sometimes life picks your battles for you, but you’ve got to be ready to fight, for your life, your success, and your happiness. When life hands you lemons, you won’t always be able to make lemonade. And when life hands you nails, they won’t always be where you want them to be. It’s not always easy, and it’s not always pretty and lemonade-y. I won’t even try to count all the other things that went wrong for me that two-flat-tire-week. But I would like to count some of the things that went right. That week, I gave presents to my little sister in Gamma Phi all week, before finally getting to do Big Little Reveal for her, and celebrate her officially being my little. That week, I aced all my exams and papers. Every single one. That week, I was elected to Gamma Phi’s executive board as our next Panhellenic Affairs Vice President, as a second-year student (executive members are almost always juniors or seniors). That week, I had a lot going on, and I did get knocked down a few times. But I got back up, brushed myself of, and made it through. A lot of things are going to happen in life that are waaaay out of our control. You won’t always have your parents/sister/best friend around to help, and you won’t always be prepared. And that’s okay. That’s life. So, if you’re going through a particularly lemon-y period in your life, know that you’re not alone, and know that this isn’t the end. Know that the sugar is on it’s way for your soon-to-be-lemonade, even if it got lost in the mail (like my sister told me, comfortingly). Know that you were created by the Creator of All to tackle each and every challenge that comes your way. Know that with all of your worries, there’s a God who’s ready to lift them all away. Know that your life will not always be full of lemons, bad hair days, breakups, failed tests, or whatever you’re struggling through. Know that when all else fails, and before all else fails, prayer is weapon against all worldly things. Know that God is greater than all things. Alright, that’s enough of my little inspo-rant for one day! I’m so blessed to be back on this blog, and even though it doesn’t seem like I’ve been gone for too long, I haven’t had the time I’d like to write in the past two weeks. For now, enjoy some freebie phone wallpapers I made for ya! Even when I’m not active on here, I’m active daily on my Instagram & Pinterest, so make sure you’re following me there so you never miss a thing! If you’re new to KristenShane.com, I’d love for you to follow me so you can get all my updates. Probably not ok for me to post BUT this momma is always here to send an extra pack or two of sugar… or at least keep you current in a AAA membership to handle all those nails. Plus encourage you to write a speech even during the worst of the worst … and send an extra prayer or two for those times it seems you’re beyond the worst day/week/month ever. Keep spreading the inspo and encouragement, blessed to be your mom..
Really love this post! Such good advice. I love this Kristen! What a crazy week, but sounds like you handled it so well! I’m right there with you, girl. This semester is in full force and I cannot wait for it to be December. Your way of writing about your lemon-y week gave me a new perspective and quite frankly, eager to have a new attitude about situations like this. Thanks for sharing! Also, great job on succeeding!! Love the rawness of this post! Beautiful analogy and comforting words. Oh my gosh learning how to handles situations without my mom was such a tough thing. When I first got to college, I was straight up robbed, and I didn’t even know how to call AAA. I’m so glad you could find comfort even when life hands you trials. I know counting my blessings always helps me when I’m feeling down. Keep it up girl!